Lead-free relaxor ferroelectrics that feature a core-shell microstructure provide an excellent electromechanical response. They even have the potential to replace the environmentally hazardous lead-zirconia-titanate (PZT) in large strain actuation applications. Although the dielectric properties of core-shell ceramics have been extensively investigated, their piezoelectric properties are not yet well understood. 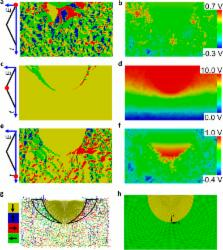 To unravel the interfacial core-shell interaction, we studied the relaxation behaviour of field-induced ferroelectric domains in 0.75Bi1/2Na1/2TiO3-0.25SrTiO3 (BNT-25ST), as a typical core-shell bulk material, using a piezoresponse force microscope. We found that after poling, lateral domains emerged at the core-shell interface and propagated to the shell region. Phase field simulations showed that the increased electrical potential beneath the core is responsible for the in-plane domain evolution. Our results imply that the field-induced domains act as pivotal points at the coherent heterophase core-shell interface, reinforcing the phase transition in the non-polar shell and thus promoting the giant strain. Lead has recently been expelled from many commercial applications and materials (for example, from solder, glass and pottery glaze) owing to concerns regarding its toxicity. Lead zirconium titanate (PZT) ceramics are high-performance piezoelectric materials, which are widely used in sensors, actuators and other electronic devices; they contain more than 60 weight per cent lead. Although there has been a concerted effort to develop lead-free piezoelectric ceramics, no effective alternative to PZT has yet been found. Here we report a lead-free piezoelectric ceramic with an electric-field-induced strain comparable to typical actuator-grade PZT. We achieved this through the combination of the discovery of a morphotropic phase boundary in an alkaline niobate-based perovskite solid solution, and the development of a processing route leading to highly textured polycrystals. The ceramic exhibits a piezoelectric constant d33 (the induced charge per unit force applied in the same direction) of above 300 picocoulombs per newton (pC N(-1)), and texturing the material leads to a peak d33 of 416 pC N(-1). The textured material also exhibits temperature-independent field-induced strain characteristics. The giant electromechanical response in ferroelectric relaxors as a critical phenomenon. The direct conversion of electrical energy to mechanical work by a material is relevant to a number of applications. This is illustrated by ferroelectric 'relaxors' such as Pb(Mg(1/3)Nb(2/3))O(3)-PbTiO(3) (PMN-PT; refs 5, 6): these materials exhibit a giant electromechanical (piezoelectric) response that is finding use in ultrasonic and medical applications, as well as in telecommunications. The origins of this effect are, however, still unclear. Here we show that the giant electromechanical response in PMN-PT (and potentially other ferroelectric relaxors) is the manifestation of critical points that define a line in the phase diagram of this system. Specifically, in the electric-field-temperature-composition phase diagram of PMN-PT (the composition being varied by changing the PT concentration), a first-order paraelectric-ferroelectric phase transition terminates in a line of critical points where the piezoelectric coefficient is maximum. Above this line, supercritical evolution is observed. On approaching the critical point, both the energy cost and the electric field necessary to induce ferroelectric polarization rotations decrease significantly, thus explaining the giant electromechanical response of these relaxors. Materials science: lead-free at last.